A couple of hundred yards from out house is a small dirt road called “Roaring Brook Lane”. It parallels a brook and goes over a small bridge to a dock by the lake. While walking the dog we decided (actually he decided – I merely followed) to go down to the dock. We haven’t had much rain of late and the brook was hardly “roaring”. In fact it was completely dry. As we walked down I caught a glimpse of movement out of the corner of my eye and decided to “check it out”. It turned out to be a large (I’d guess almost 2ft long) snapping turtle dragging itself out of the dry water course. I understand from my reading that they rarely leave the water unless they are planning to lay eggs, and that the egg laying season is from April through November. 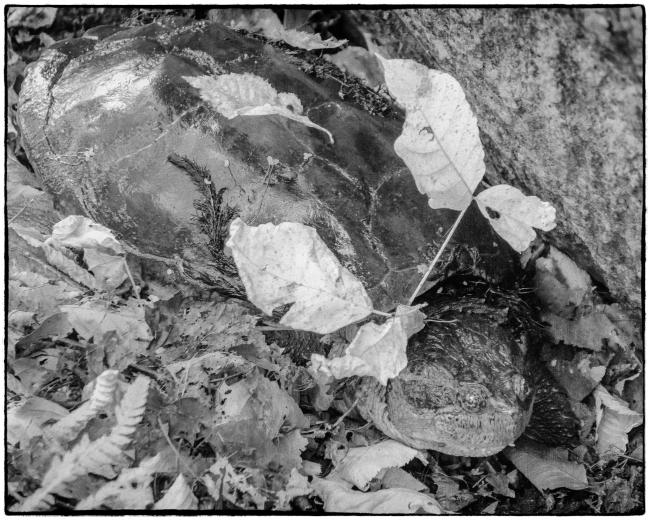 This picture was taken in mid-October so I imagine that the turtle was looking for a spot to lay its eggs. From its appearance it’s a common snapping turtle rather than an alligator snapping turtle, which I believe is found farther south in the US. Whichever it was I stayed well away from it and quickly left. I didn’t want to disturb its egg laying and I’d also heard that such creatures can deliver a nasty bite.